This site is not dead but… I do need to find it again. Keeping focus and staying true to your own voice are not easy when you look around at other sites and start comparing yourself. If you can manage to do it constructively, that’s great. I’ve gotten sucked into my own wormhole of blog envy. Not envy, but self unsatisfaction. So, I need to pull myself out of it and get back to the basics, again. The key to sustainable blogging is showing up and showing up the next day too when you’re run out of stuff to say and feel like everyone is doing it better than you are. This list comes from Katy Rose, the Modly Chic blog. I found it in submissions for fashion blogs at dmoz. I usually take a look around at sites I’m listing. Some just get a skim for the basics, to make sure they are original and focused on topic. Ironic, eh? So often we know the answers but we haven’t been paying attention or didn’t want to remember. Have you tried asking people to write for your site, as contributors (free/ contributed writers)? It’s complicated. We don’t feel good about asking for free content. But, there are good reasons to write for another site, even if you aren’t paid in dollars, or cents. If you write for another site (as contributed content) make sure you get an author profile with links to your own sites and a little write up about who you are and what you do. If you want to find writers for your site make sure you set the terms clearly. Don’t leave them expecting to be paid and hope they won’t notice or make an issue out of it. Tell them about your site and your readers. Interest them in what you do. Talk about your future goals but keep it short until they ask for more information. When you request a guest/ contributed post from them think about how you would like to be approached yourself and be sincere. 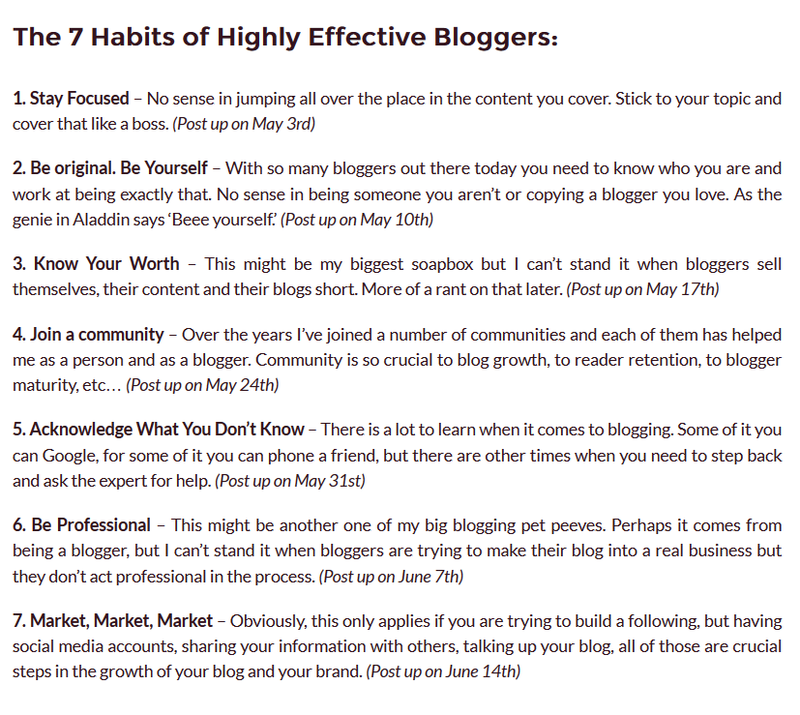 via Reverse Guest Blogging Will be Huge in 2014: How it Works. Time to End Picture Book Blogging? I think its time to stop posting images with every post for the sake of having an image with every post. Unless your site is showcasing your art, illustrations and photography, most of the images posted are just decoration. How many stock images do you really need to see in a day? We are adults, we read books without pictures on every page. Usually the only pictures are on the book cover. Magazines and newspapers run images with articles but not random, meaningless images. Isn’t it time to put away the pretty pictures in our sites too? Unless an image is required to illustrate a point or give directions, why are they needed? I know people think the images help with SEO, but do they really? Want your site to load faster, dump the picture book images. Often the image is something barely relevant to the topic. It does nothing but add colour. We are not children. We don’t need colourful picture books. Treat your readers like the adults they are and put away your picture book blogs. Posted on May 9, 2016 Categories bloggingTags blogging, book, books, image, images, SEOLeave a comment on Time to End Picture Book Blogging? The old blog was formatted with posts by date, that was when the freshness of the post mattered. The most recent data was most important. It still works for some sites, like a news feed. Now, more sites are about content, content curation specifically. The date is still part of that, but not the focus. (Note: I’m not for removing dates from posts because I want to know the post I’m reading isn’t years old or no longer relevant). It’s time sites were content focused, not date focused. Put your content first and show your posts in the format of an article directory. Sort them by topic and subtopic. Show them that way on your main site. Save people from searching your site for relevant content, bring it to the top for them instead. Not every site still adds search and this is a mistake if your posts are organized by date first and category in the sidebar, maybe. You are leaving people to find information from your site in a hit and miss way. Why? Isn’t the point of your site to provide information and resources? Every site should have a claim to fame, tell people who you are and why you are a resource in your niche or topic. Then comes the actual information, or the product you are selling. Make it easy for people to get there. Article directories were on the right track but it’s not about syndicating your content to other sites or bringing in other people to speak for you. Speak up for yourself. There are good points in here, things I have been thinking myself. But, not for an article directory of content from other people but my own. The best two points from this post (link above) are controlling your own content and how it is shown (if it is shown at all) and showcasing your content to build your own authority in the topic. Of the two I think building your own authority in your niche is the most important. Share links but stop giving your content away for free. Make your site content focused by curating your own content. Many blogs have begun using the infinite scroll which means their blog posts go on endlessly, bottomless. It may be good for keeping people reading your site longer, preventing bounces. But… please throw your readers a lifeline – add a link back to the top of your site. With infinite scrolling it would also be nice if people provided a floating link to get back to the top/ start. I wanted to look for your Twitter link after reading far down your bottomless posts. (I was in 2013). Not everyone knows basic things like keyboard shortcuts these days. A floating link is best because it will stick with people as they read. Plus, it jumps around a bit and tends to get noticed. Modern bloggers are limited by caring too much about other stuff – Google, SEO, readers who might or might not come back, advertising, and so many other business and marketing related things. Since blogging became a business and a marketing scheme, it has limited itself. Blogging stopped being really creative, innovative and inventive. It lost that loving feeling. When did you last feel excited about your site? The day you started it? Over the holidays when you added some Christmas images? When you took that week off and came back to it? We should be feeling excited, happy or at least interested in our sites all the time. Modern blogging has taken that away. If you blog to make Google happy, to make your readers happy, or to perform marketing tricks, when do you blog to make yourself happy? Don’t start telling me you blog to make money – it’s your business. If you really believe that why are you here? Go away. Yes, go, leave… now. Creative blogging is about doing something you can love, enjoy, value beyond dollars and cents. What do you really want from a blog? When you got the idea did you visualize something fabulous, in full colour, a showcase for yourself, your ideas and your path to fame and popularity as a celebrity of your own making! Sure you did. I don’t know anyone who didn’t start a blog with the idea of becoming a web celebrity, even if they didn’t (and would never) tell anyone else or admit it to even their best friend and most trusted brother or sister. At one time people were calling themselves a web or Internet personality. It was a way of saying they were someone other people knew online. Setting yourself up as a celebrity tempts people to pop your bubble. So, the best way to be a web personality is to just do it and not talk about how famous, well connected and popular you are. Just be and let the chips fall where they will. These days the blogging celebrities seem to be people who tell us they are celebrities – they tell us how to make money and market our blogs/ sites. Most of them, if you do the fact checking, have not had a site for a full year. Maybe they have an attitude, a way of writing, which people listen to. That does not mean they know what they are talking about. It does not mean you should listen to them and believe all they say or do anything they tell you to do. Blog your own way. Be creative. Be inventive. Discover your own way to blog and be happy with it. Have fun. Creative something you really like rather than something you feel obligated to work towards. You can be a happy blogger. Just stop caring about what what everyone else is doing. I’m changing the way this site works. I think we are past the days when one person could run a whole site, alone while doing all the site maintenance, promotion, writing, publishing and so on. I think having a schedule for posting is more important than it has been in the past. Keeping a daily post does make a lot of difference for traffic to a site. I have seen that with my own sites, clearly. However, I am still working alone here. I like it that way but it does leave me with more than I can take care of (with several sites now to take care of). So, I am changing the way I blog. I’ve been a content curator in one way or another since 1998. As an editor at the Open Directory Project I decided which sites suited the topic and I edited the submissions before posting them. No one had thought up content curation then but that’s essentially what running a directory is. Later I worked on other sites, writing, listing links, publishing newsletters, managing forums and all that stuff. Currently I have several topics via the Scoop.it site. I’ve changed them around, deleted some and started up others again when I missed them. It has been a good way to find my focus or niche area. You need that understanding to find a topic or niche you can sustain. Onto the present with several sites not so active for awhile. I’ve decided to continue posting them with a mix of my own original posts and posts created with my comments on curated posts from other sites. The hold up on getting it all flowing right now is just the technical side of making it work in the way I can work with it. Anyway, this site is one which will be converted soon. 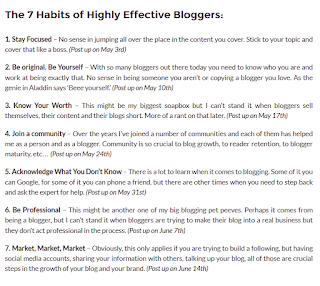 It’s a topic I have a lot of passion about but anything about blogging is drowned out by the SEO “experts”. There is a lack of creativity and originality in blogging. I’d like to keep that element from disappearing. I’d like to see blogs go back to being free spirits rather than marketing hags. Content Creation: The act of writing original words, taking an original picture, shooting an original video, etc. Content Sharing: Taking a piece of content created by yourself or others and distributing it to a following or audience. This can be done in many ways and through many channels; blogs and social media outlets being just a few of the more popular examples. Content Aggregation: This is like content sharing on steroids. An aggregator typically uses software that automatically pulls in content from multiple sources (such as RSS feeds) and reposts it all at one central location, usually a blog. Content Curation: Similar to content aggregation, content curation also pulls from many sources. However, instead of automatically posting every piece of content pulled in there is a manual filtering and sorting process that takes place in order to select only the most valuable pieces of content for a given audience. Curation also involves adding helpful annotation that frames the information already provided from the original source in such a way as to add additional value and/or understanding. This post about building authority online is good for beginning bloggers but also those who have burnt out and want to try again. Do try again. Don’t expect instant success. Step 1: Narrow your focus. Step 2: Stop reading just blog posts. Step 3: Write authoritative articles. Quote other authorities in your industry. Don’t be afraid to take a contrarian view. Use stats and detailed case studies to add substance. Step 4: Build an Audience. Step 5: Build a Fan Club. Real authorities solve their audience’s problems. Consistently. Repeatedly. That’s why people listen to them. And spread their ideas. via –No Authority Yet? Here’s a 5-Step Plan to Become Seriously Influential Online – Enchanting Marketing. If you start with the first three steps you’re on the right track. Work on building an audience and fans once you have a body of work to present to them. It’s not true that once you build it they will come. You do have to reach out there and let people know you are there. Too much information overload with repetitive and sub-standard content has created a lot of stuff no one wants to read. So, you do need to shine your own light to help people find you and show them you actually have something worth the visit to your site. Narrowing your focus or deciding on a niche is not as easy as it seems. I have so much I want to find out more about and then so much to share once I do get information and resources. I end up being all over the place when it comes to my niche and focus. There is also the problem of spreading yourself too thin and burning out. So, getting and keeping a focus early on is good for your site, your authority and yourself. It gives you authority and keeps it all sustainable. Reading just blog posts for our information and sources for interviews does limit us. Don’t forget there is a lot you can do offline, contact local people directly, read books from before the Internet and find information which hasn’t made it out of print books yet. Build a history of information with various sources – that is the area to grow and evolve and find contacts in which will also give you knowledge to share. Writing articles we tend to fall into standard post formats and get comfortable there. Evolve with post style to have variety in your niche. Read about other post formats and when you read other blogs look at what they do and think about your own reactions to it. What kind of posts work best for you as a reader in your niche? Use this research about post style when you write your own blog. What Happened to the Canadian Blog Awards? Seems like both the Canadian Blog Awards sites have finished in 2014. I hope both of these sites are saved in the Internet Archives. Have we gone beyond the blog? Is that why the blog awards fizzled out? No one seems to have offered to take over as the Awards closed or faded out. I think blogging is the culprit, more than the Internet. Blogs aren’t built or kept the way they used to be. So blog awards can’t be created that way either. It’s the age of the application, the mobile web. I’m not an expert (don’t even want a cell phone) but I think it’s a shame to see Canadians on the web lose a resource like the blog awards. Has blogging become out dated? How do you use the Internet these days? Do you even have a site? The jury uses a number system to value the criteria and weight their decisions. The weblogs in each category will be judged against two divisions of elements: Design and Content. Each division’s elements will be awarded 0 to 2 points — 0 if the element is poorly executed, 1 if the element is average, and 2 if it is excellent — for a possible perfect mark of 20 points. Usability and accessibility — Is the website user-friendly and easy to navigate for people of all abilities? Functionality — Do all of its components function properly? Interactivity — Are a comments section and author contact information available? Are its interactive components (including comments, audio, video, etc.) effective and functional? Aesthetics — Is the website pleasing to look at? Is its design original? Originality — Is the content original and creatively expressed? Intelligibility and clarity — Is the content well-written? Are the content’s messages clearly and effectively delivered? Currency — Is the content timely? Is the weblog updated on a regular basis? Transparency and authenticity — Is the author’s purpose and realness both trusted and apparent? Attention to detail — Has the content been edited for spelling and grammatical errors? Is the content arranged for ease of consumption? Engagingness — Is the content interesting? Does it contain broad appeal within its genre? In the second and final round of judging, Category Fit will be added as an extra criterion for an additional score of 0 to 2 points, and weblogs with their own domain name (weblog.com rather than weblog.blogspot.com, for example) will have an additional point added to their final score. Posted on March 11, 2015 Categories bloggingTags blogging, Canadian, content, Fashion Design Mode, phone, websiteLeave a comment on What Happened to the Canadian Blog Awards?